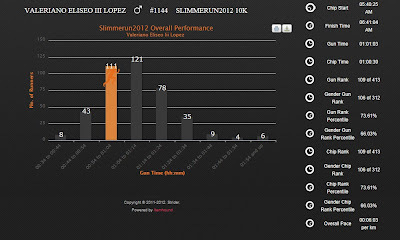 Slimmerun is an annual fun run organized by Slimmer's World International, Inc. This year, this event was held on May 5, 2012 at the 28th avenue, Bonifacio Global City. I joined this run last year and it was a fun experience so I didn't let time pass and registered as soon as I could. And since it was scheduled a year after my first official fun run event, this was my runniversary event. As I declared in a blogpost, I decided to break my 10k PR in celebration of my runniversary. Unfortunately, laziness struck and I didn't trained seriously to attain my sub-60 PR goal. But as a last resort strategy, I just made sure to run in a 5:30 min/km. Another thing is I went home late last Friday night so I didn't prepare much for the race much more (LOL). So I met fellow PRC (Pex Running Club) members, Bern and Emy, and fellow Team Titan Member, Rolly, at the starting line and ignored the dance-y warm up by a Slimmer's World instructor. We ran at our own pace so I was on my own with the pressure of keeping a 5:30 min/km pace. For my sixth kilometer, I was on my way back to BGC and started to walk a little to get a sip of water. I clocked at 6:09. On my seventh kilometer, I walked a little again and pushed myself to the 8km marker. I clocked at 6:25. My eighth kilometer was the longest stretch of this 10k race and clocked at 7:16. At this point, I was almost at my target time and distracted myself by noticing things about my fellow runners like one runner had the same shoes was mine and another runner was the girl who won MH Urbanathlon last year. I was still enthusiastic at kilometer 9 but I was nearing my target time. I was feeling like all my food had already been burned and I was motivating myself that my body fat was being burned at this point. Also, I was not letting these 5k runners run past me and clocked 6:25 mins. At the last kilometer, I knew I wasn't going to reach my sub-60 dream but I was determined to get a new PR nonetheless so I pushed myself to as much I could. When I crossed the finish line though, the 10k marker didn't have an official time but displayed the time so I had to rely on my watch to tell me my unofficial time, which was 1:00:53 and I shed a few seconds from my previous PR. Hours later, my new official PR is 1:00:39. Slimmerun was overall a fun and great event. Each kilometer had a kilometer marker and my GPS watch beeped at the same time I saw those kilometer marker. Hydration wasn't cold and refreshing but they gave out water in bottles which was easier to clean up and don't appear messy as paper or plastic cups. Baggage Counter didn't present problems in claiming and depositing but they weren't easy to see since the put their banner where people are lining up. I must admit last year's event was more exciting but freebies and sponsor's stand was still interesting. Another good thing about the race is that there were fewer people in this race that the usual big events so lines weren't long. Post race event was also a usual awarding event that was organized and didn't present any issues. 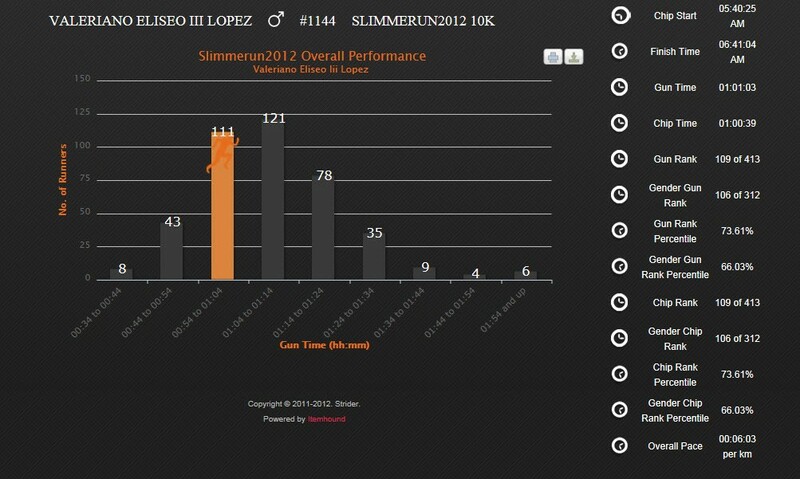 I will definitely be back in next year's Slimmerun as long as they keep this up in terms of race organization. Last year, I joined my first 5k run when I finally was able to find running buddies as KC and Gelo was able to accompany me on a fun run. A lot of things had changed. I already have teams who I can go with in any race I want to join. I could do any pace I want, whether race or chikka pace, to push myself or play around the roads. I have running equipments that I didn't dare use a year ago. I know terms I had no idea about a year ago and I know a lot more people in the running community. As Bernard told me, "Ang dami mo lang kilala dito... and nakilala mo sila in a span of a year of running"... AWWWW! Run Event Organizers and other friends who made my first year of being part of the running community great! Cheers to more kilometers logged, farther run event distances, faster chip times, newbie runners turned running addicts and bigger running teams! congrats thirdy! bagay na bagay kay rolly ung pink bib nya. lol! unting-unting push na lang, sub-1 na yan! go go go!